SYRACUSE, N.Y. — The photovoltaic (PV) panels installed this week at the SUNY College of Environmental Science and Forestry (ESF) convert sunlight to electricity and are expected to contribute to a 20 percent reduction in the college’s dependence on energy from traditional sources. The panels on the roof of Walters Hall will supply 15.4 kw of energy, or about 1.5 percent of the college’s total energy needs. That translates to about one-eighth of the annual energy consumption in Walters Hall, home to ESF’s Department of Paper and Bioprocess Engineering. 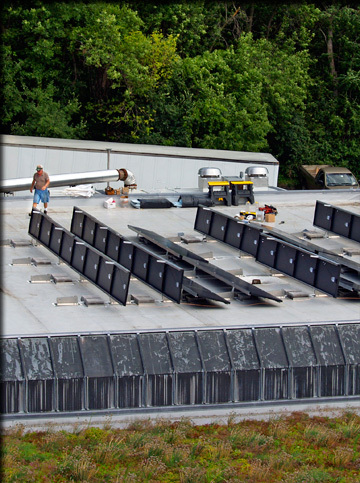 More photovoltaic panels will be installed on the newly renovated Baker Laboratory this fall. When energy from the PV system is added to energy provided by ESF’s carbonate fuel cell, which is capable of providing about 17 percent of the college’s electricity needs, alternative, renewable energy sources will provide at least 20 percent of the college’s needs. Paul D. Tonko, NYSERDA President and CEO said: "This investment is another example of NYSERDA's commitment to help transform the way we produce and consume electricity in New York State. Our PV and wind incentive programs are designed to reduce installation costs by about one-half for residential and commercial installations." Tonko also noted that NYSERDA helped fund the installation of the ESF fuel cell combined heat and power system that provides power and supplemental steam to the college and is included as part of their student curriculum. NYSERDA funding provided $75,000 of the $163,000 needed for the photovoltaics on Walters Hall. “We are installing renewable energy technology on campus to be utilized in our instruction and demonstration mission,” Murphy said.